Well, hello there on this TUESDAY. 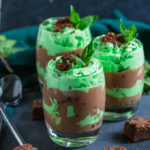 I know, I know, I haven’t posted on a Tuesday for a while, however, I have news and delicious Mint Chocolate Trifles to share with you! First bit of news: up until Christmas I’m going to be sharing two recipes per week because I have so many ideas for delicious festive desserts. Second bit of news: After a lot of tears, stress, pain and going back and forth, I handed in my notice at work last week so come January I’ll be back blogging full time! Leaving my job was not an easy decision to make. I’m devastated to be leaving as I’ve enjoyed it so much and I adore my colleagues, however, it’s become increasingly difficult and painful to carry out my job and last Sunday was breaking point for me. There’s quite a lot of back story to my decision, I’m not going to go into the details of why my job became more painful, I’ll just say that on Sunday morning, after working Saturday, I woke up and physically could not get out of bed. My husband and family begged me to stop hurting myself, I tried adjustments at work and none of them worked and I was coming home and feeling completely useless as I was in so much pain. If I wasn’t at work, I was resting trying to get ready for the next shift of pain. For a good chunk of time, work and blogging worked together. I worked half the week out of the house and then the other half on my blog, but it wasn’t working anymore. I’m not normally someone who puts myself very high up. I always look after everyone else and grit my teeth and put up with the agony of my back, however, it’s just way too risky to be lifting boxes, bending and standing for long periods of time. At least at home, I can work, but if I need to sit down for a minute I can. I have to keep reminding myself that I’m the only one who suffers. I’m the one who goes home in tears because it hurts to breathe and I only have one spine. I need to look after it and not exacerbate my condition. So yes… a big change is coming. And that’s only half of the change! We have more going on still, but that’s enough for one week haha!! 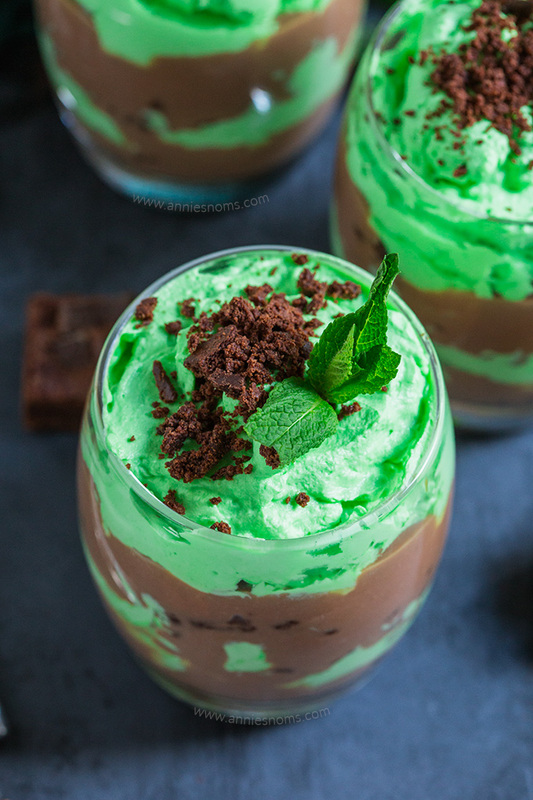 Let’s talk about these Mint Chocolate Trifles! You can make them ahead, easily double the recipe and there’s no baking involved! They are sure to be the cherry on top of any Christmas meal! I used chunks of chocolate brownie as the cake layer, made mint chocolate custard and for my final layer, whipped up some cream with sugar and peppermint extract. 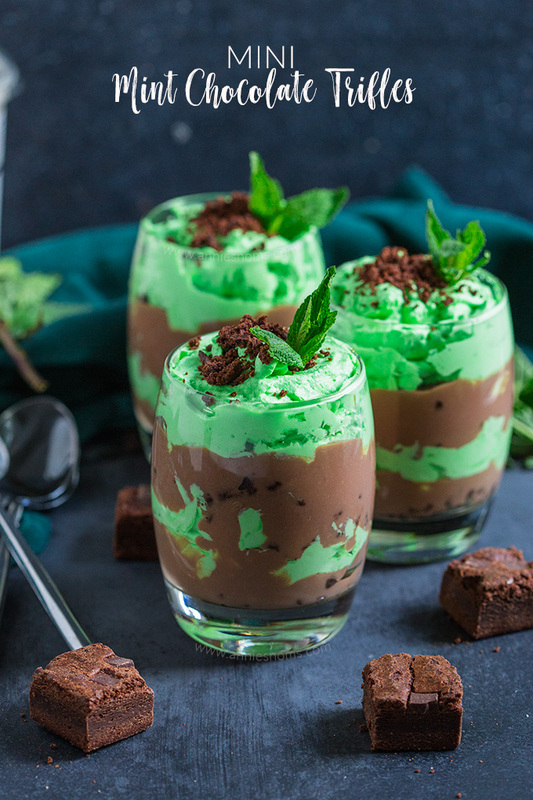 A sprig of mint and smattering of brownie crumbs top off these epic little desserts. These trifles are soooooo packed with flavour; milky chocolate, light peppermint, rich brownies…. they’re pure bliss! I can’t believe something so simple to make tastes quite so delicious!! Enjoy and I’ll be back with some epic brownies on Thursday! Place the custard, chocolate, peppermint extract and salt into a medium sized sauce pan and place over a low heat. Stir the custard until all the chocolate is melted and the mixture is smooth. Leave to one side to cool. 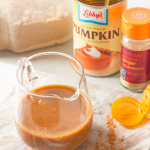 Make the whipped cream: Place the cream, sugar, peppermint extract and a couple of drops of food colouring into a large bowl and mix gently to check the colour. If required, add more food colouring and stir it gently. Once you're happy with the shade of green, whisk the cream until stiff peak. You want to be able to pull the whisk out of the mixture and have the peak stay up. 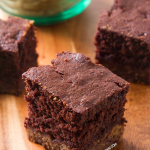 Crumble the brownies into a small bowl, crumbs and small chunks are fine. Take 4 individual sized trifle dishes/jars/glasses and place a layer of brownies on the bottom of each jar; around 1tbsp of brownie pieces. Spoon 2 tbsp of the custard mixture onto the brownies, then spoon 2-3 tbsp of whipped cream on top of the custard. Smooth gently into an even layer, try and cover the custard but if you don't completely, it's totally fine. These will still look awesome even if you just dump everything into the glasses! Place another layer of brownies, custard and then cream. The 6 layers filled my glasses, but repeat if you have supplies left and room in your glasses. 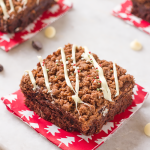 Finish with a sprig of mint and a sprinkling of leftover brownie crumbs. Mini Mint Chocolate Trifles will keep covered, in the fridge, for 2 days. Glad to hear you made a change for the benefit of your body. Sometimes that is a hard choice to make! Anyways, these trifles look amazing! Definitely a hard decision, but the longer I think about it, the more I know it was the right decision!! Now this is my kind of dessert. 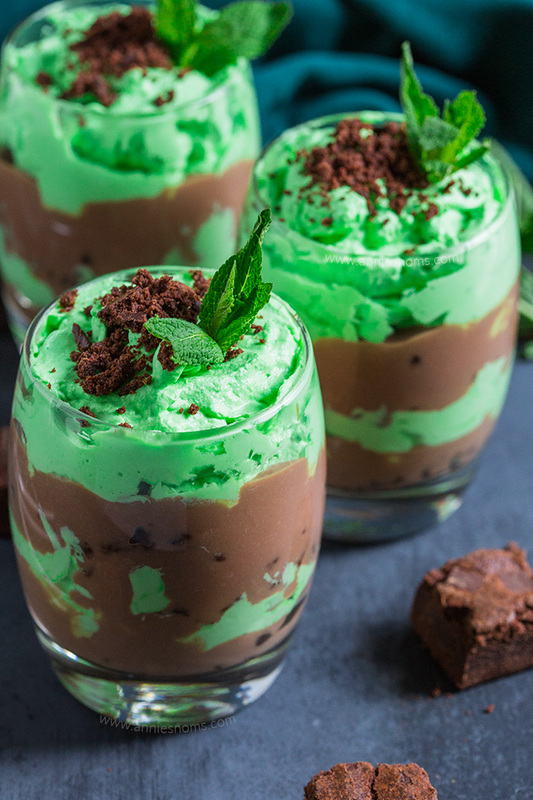 I love mint as a flavour and these look amazing! Thank you! 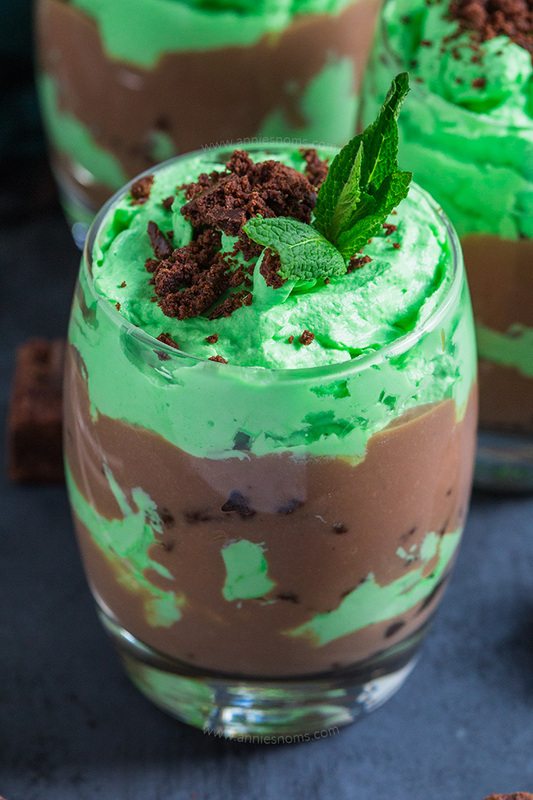 Yep, I’m a sucker for anything mint chocolate too! 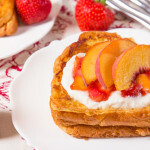 Festive dessert and easy too. Nice to see a different alternative to spiced Christmas dessert. Yum! Thank you! I’m trying to not make too many spiced things this year as previously I’ve gone pretty hard!! Love the beautiful colors of this and it would be so perfect for the holidays too! These are just the perfect size for entertaining. And mint is classic to serve during the holidays! I love the presentation! Thank you! I love an individual sized dessert, makes serving so easy!